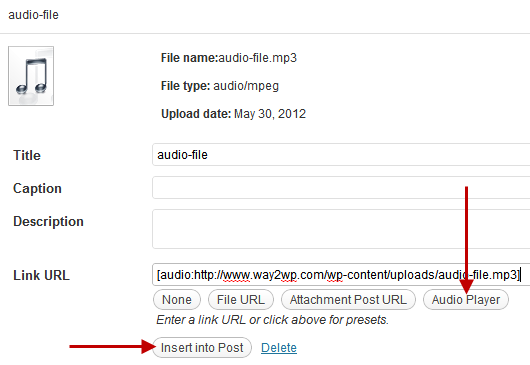 Do you want to add or embed an audio file or a .mp3 file in a WordPress post or page? Its really easy to do this but you will need to integrate an audio player or .mp3 player with your WordPress theme. Fortunately, there is no need to manually integrate an audio player with your theme. You can just use a plugin that handles everything automatically. So before you try to embed a .mp3 file to your WordPress post, first install and activate the audio player plugin. You can install the audio player plugin by downloading it on your computer and uploading it to wp-content/plugins folder via FTP. You can also simply search for Audio Player in the Plugins > Add New inside your WordPress dashboard and install it automatically from there. Once you have installed the audio player plugin, you are ready to add an audio file or a .mp3 file to any post or page in WordPress. Just upload the audio or .mp3 file using the media uploader. Then click on the ‘audio player’ button, and then click on ‘insert into post’ button. You can now publish the post or page. The audio or mp3 file will be added to the post with an audio or mp3 player, as displayed below, automatically. If you face any issues while adding audio files or mp3 files to WordPress then post the details below and I’ll be happy to help you.